In this topic, you can learn about early access and beta programs and how you can participate in them. Dynatrace Early Access Programs (EAPs) provide you with access to new features so that we can hear your feedback and ultimately deliver features that exactly meet your needs. While planned, there is no guarantee that an EAP feature will ever reach GA status. EAP features aren&apos;t meant to be used in production environments. EAPs aren&apos;t covered by our Support team, but rather by product management. SLAs don&apos;t apply. Qualifying customers are selected based on technical criteria. Final decisions are made by product management and there is no guarantee of participation. While participating in an early access program, you agree to stay in touch and provide feedback. EAPs are available to both SaaS and Managed customers. The following EAPs are currently open for participation. AWS Lambda lets you run code without provisioning or managing servers. This deployment model is sometimes referred to as "serverless" or "Function as a Service (FaaS)." Technically, a Lambda function runs in an application on a container managed by AWS. This lets you focus on writing code without worrying about the underlying application or infrastructure. Lambda functions are ephemeral and autoscaling. This EAP adds monitoring to Lambda functions running Node.js. Documentation How do I integrate Node.js Lambda Functions? The following EAPs have been completed. New features are introduced in a beta phase on an opt-in basis. Beta features aren&apos;t feature complete, but they are publicly available, fully supported, production-ready, and available as a user opt-in. You can now use Environment ActiveGate (version 1.157 and above) to retrieve CloudTrail logs that are stored in your AWS S3 buckets. Troubleshooting insights are particularly valuable for Dynatrace users as actions logged in CloudTrail. For example, reconfiguration events often have significant impact on the performance of your applications. Planned GA date Feature will be improved. Currently no GA planned. You can now use an Environment ActiveGate (version 1.157 or higher) as a listener to log streams using HTTP POST or TCP/UDP syslog. With this new functionality, you can now enrich your troubleshooting options by extending diagnostics data coverage beyond the OneAgent-instrumented aspects of your application infrastructure. Dynatrace now automatically detects the organizations that are related to your Cloud Foundry foundations. The Cloud Foundry organization property exists on the process level with the other Cloud Foundry properties that Dynatrace detects automatically: space, space ID, application, application ID, and instance index. 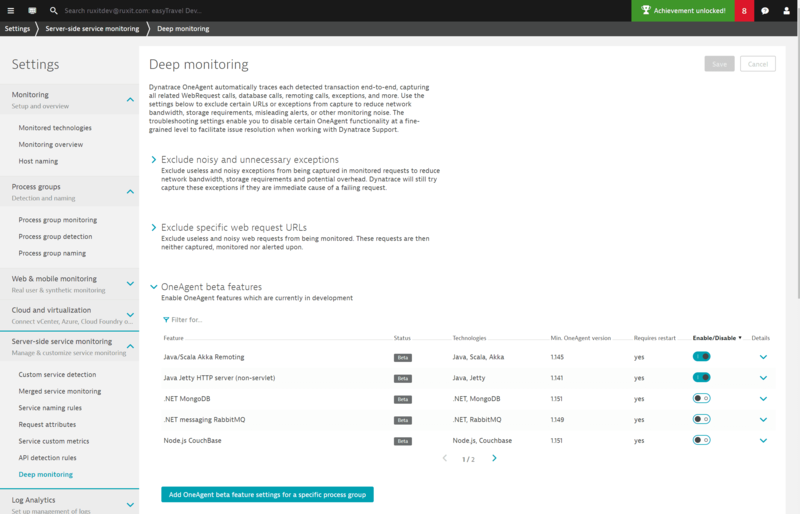 Dynatrace can now use process group monitoring rules to control the “deep” monitoring of your applications. These rules allow you to define which kinds of applications you want to exempt from deep monitoring and which ones you want to include. A OneAgent beta feature can be enabled either for the entire environment or within a few process groups for testing purposes. Each feature specifies a minimum OneAgent version. A beta feature can only be activated for OneAgents that satisfy the minimum version requirement. Some beta features also require a process restart before becoming operational. Go to Settings > Server-side services > Deep monitoring. To enable or disable a feature, use the corresponding switch. To make a feature available for testing within select process groups, click Add OneAgent beta feature settings for a specific process group. A new improved version of Java Real User Monitoring. This version brings better performance and improved compatibility (specifically with Netcracker and Apigee). Enable IBM Integration Bus support can be enabled in the Dynatrace Settings -> Monitoring -> Monitoried technologies -> IBM Integration Bus switch. Starting with OneAgent version 1.161, you can monitor PHP version 7.3. Enable this to get visibility into MySQL DB statements in Node.js applications when the mysql2 module is used. Starting with OneAgent version 1.155, you can monitor PHP on your Windows (IIS/Apache) environments—full-stack monitoring is now available on Windows for Apache mod_php applications and PHP CGI. Dynatrace is the only vendor that has fully automated code level and end-to-end transaction level insight for golang applications without any modification of your go code. Just set the Go Technology switch and go. Use this if you have a HTTP or SOAP server based on Jetty HTTP server 9.2+ that does not utilize a servlet container. Examples include Akana by Rogue Wave. This will provide full web request service support for such scenarios. Visibility into CICS requests from your Java tier via IBM CTG. Visibility into IMS requests from your Java tier via IBM IMS Soap Gateway.